What would the UK be called without Scotland? 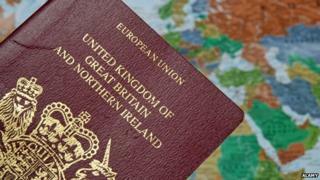 The UK crops up on postcards, passports, in the United Nations and the Eurovision song contest. Would its name change if Scotland says "Yes" to independence, asks Esther Webber. In reality the country could, and probably would, continue to be known as the UK. It's difficult to imagine a Westminster government advocating anything else. But the suggestion that "UK" might need replacing if Scotland becomes independent after the referendum on 18 September has already led to some alternative shorthands being bandied about. "The rest of the UK" is the handle used most commonly - it appears 293 times in the Scottish Government's white paper on independence - but leaves England, Wales and Northern Ireland in danger of sounding like Scotland's cast-offs. It's also a bit of a mouthful. Its abbreviation, rUK, is already used by Scottish universities to differentiate between students from Scotland and those from the rest of the UK in relation to tuition fees. It regularly appears in Scottish newspapers such as the Herald and Scotsman. Meanwhile, several Scotland analysis papers published by Whitehall favour the onward plodding of "continuing UK". "Future UK" has been floated as an idea by John Lanchester in the London Review of Books and "Former UK" by the Spectator columnist Charles Moore. Snappier perhaps, but as both writers have pointed out, the abbreviation - fUK - is somewhat unfortunate. The UK has had its fair share of makeovers in the past and the different names used are often loaded, Prof Linda Colley of Princeton University points out in her book Acts of Union and Disunion. Jonathan Swift wrote in 1738: "Pox on the modern phrase Great Britain," unhappy that it excluded his native Ireland. For a time Scotland was sometimes referred to as "North Britain" - a term coined in the 17th Century by unionists which would now be considered highly derogatory by most Scots. The 1706-7 acts of union joined England and Scotland (previously separate states with separate legislatures, but with one monarch) into a single, united kingdom named "Great Britain". The United Kingdom came into usage with the 1801 Act of Union, which brought together the Kingdom of Great Britain (England, Wales and Scotland) with the Kingdom of Ireland. In 1922 the Irish Free State came into being. After World War Two, it became a republic. But according to Prof Daniel Szechi, a historian of early modern Britain at Manchester University, Scottish independence might take us even further back, to a very "retro" constitutional arrangement. "In the event of independence, we are getting back to a pre-1530s point - where England had indirect ruling powers over Ireland and Wales but not Scotland. "Before that, Ireland and Wales were part of an Angevin empire that included parts of modern France. I think renaming the UK 'the English empire' would not, however, sit well with the Welsh and Northern Irish." Alan Trench, politics professor at the University of Ulster and author of the Devolution Matters blog, says it's "probably right" that the term UK would endure beyond Scotland's membership. "There are good reasons why the rest of the UK might choose to keep its name - but ultimately that would be up to the rest of the UK to decide, post-independence," he says. Perhaps England, Wales and Northern Ireland should take comfort in observing that Scotland is not immune from the rebranding question. Newspaper readers north of the border are by now used to seeing references to an independent Scotland as "iScotland". Send us your suggestions on what the UK without Scotland would be called using the form on the top right hand side of the article.